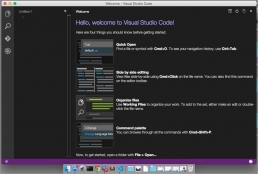 Microsoft announced the launch of Visual Studio Code, a lightweight cross-platform code editor for writing modern web and cloud applications that will run on OS X, Linux, and Windows. Visual Studio Code has syntax highlighting for dozens of languages, the usual suspects like CoffeeScript, Python, Ruby, Jade, Clojure, Java, C++, R, Go, makefiles, shell scripts, PowerShell, bat, XML, you get the idea. It has more than just autocomplete (everyone has that, eh?) it has real IntelliSense. It also as IntelliSense for single files like HTML, CSS, LESS, SASS, and Markdown. There’s a huge array of languages that Visual Studio Code supports. This a code-focused and code-optimized lightweight tool, not a complete IDE. There’s no File | New Project or visual designers. If you live and work in the command line, you’ll want to check free tool out. Fast like Flash 😉 – I love how fast this tool is. It opens fast, edits fast, debugs fast, navigates fast. Autosave (must needed) – love it! Quick Fix – Learn CMD+. … when you see a light bulb, VSCode is giving you a hint that you can refactor this, and it will offer suggestions on how! You can also follow Visual Studio Code on Twitter at @code And Download Visual Studio Code.